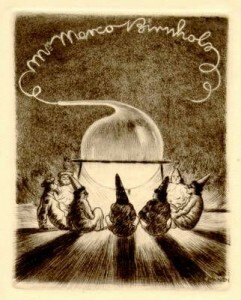 Ex Libris is an animated documentary feature film tracing the vanished world of the ex libris – also known as bookplates – collection my grandfather commissioned, created and lost in Vienna between the two world wars. Ex Libris will explore the intimate, intricate, universe my grandfather created in his ex libris collection, and the exploding world he recorded in his diaries. My grandfather Marco Birnholz was born in Bukovina in 1885, and moved to Vienna in 1905 to attend university. He commissioned artists of the day to create more than two hundred ex libris, small works of art, which narrate his life and themes of interest. He created ex libris on medical and alchemical themes, Jewish motifs, erotica, and even his wife’s bridge games, creating a visual autobiography, a vibrant universe parallel to his everyday life as a neighborhood pharmacist. Ex Libris frames and retells my grandfather’s story as he did: through the drawings he commissioned and collected. These iconic objects were an obsession and an important expression of his identity. In Vienna between the two world wars, they earned him membership in a community of collaborative artists and collectors, and his collection was widely known. On the surface, Marco was an ordinary man — an established and respectable businessman, a loving husband and father – caught in extraordinary circumstances – the collapse of the Austro-Hungarian Empire, and the Nazi occupation of Vienna. But he was also a keen observer and eccentric dreamer. Marco’s diaries, kept from 1911-1961, provide a narrative spine for this turbulent tale; allowing his rich, observant voice to offer content and commentary.